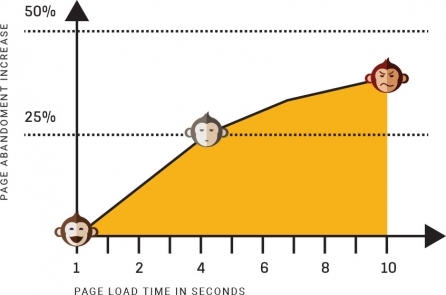 Websites that take 4 seconds or more to load lose more than 25% of their audience (Kissmetrics). With PHP 7, your website will be able to respond to more than 50% more user requests per second than on previous versions of PHP (Benchmarks study). 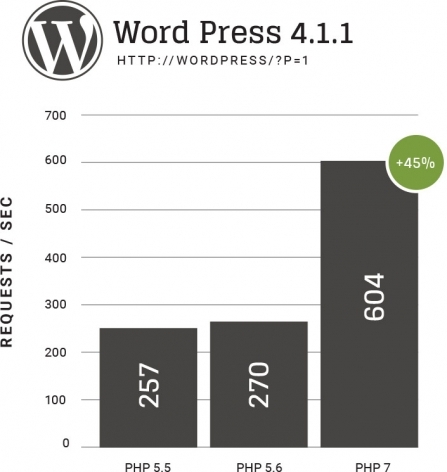 Results are similar for WordPress sites. 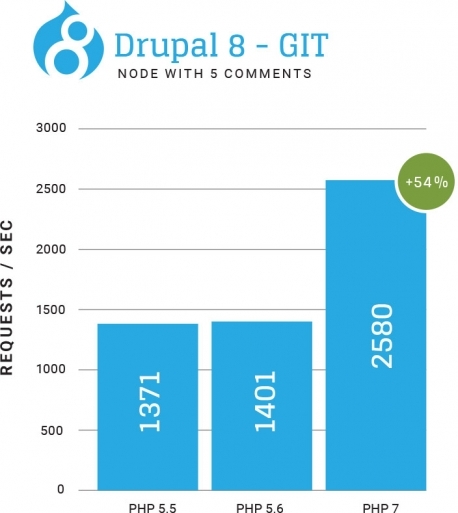 PHP 7 speeds up your site increasing site engagement and conversion. Ouch! Did you know that Google now penalizes slow websites? * That’s right. Not only are you losing clients because of site loading times, you aren’t even getting in front of them. Improved performance speed, reduced memory usage, and superior support systems, allow PHP 7 to keep your website moving smoothly and quickly. Take that google. Take that! PHP 7 helps to keep your website optimized for speed so your website is easier to find in search results. Not only does PHP 7 feature a range of execution engine improvements and can juggle multiple (unrelated) tasks simultaneously, it can also handle more tasks with the same amount of resources. These abilities significantly decrease the chances of your website crashing unexpectedly, at the worst possible moment. Oh, and did we mention this decreases server costs and security risks, and improves mobile performance? No? Silly us. PHP 7 can help you do all these things. It’s kind of a big deal. PHP 7 helps improve overall website performance making it easier for your audience to find what they’re looking for. *Speed is one of many factors that will affect how well you rank in the search results. Not all sites will be ready for the PHP 7 upgrade right out of the box. Your website may need extra modifications and upgrades before it’s ready to work with PHP 7. To upgrade your website to PHP 7, you will need to work with a professional development team. Cheeky Monkey developers will review your website, test it, and confirm the upgrade is properly implemented. You wouldn’t want to accidentally break a core aspect of your website would you? If your website isn’t upgraded to PHP 7 properly, your website could crash. Downtime costs money, so don’t just hit a switch. Let a team of experienced developer monkeys do the job right the first time around. We will launch your website in PHP 7 together. We will confirm your current platform will support PHP 7. If your website won’t support the upgrade out of the box, we will work with you to get you there. We will confirm that all your WordPress plugins and Drupal modules will work in PHP 7 before we start. There is no point in upgrading if your most important plugin/module won’t work on PHP 7. We make sure that every part of your website is compatible with the upgrade. We will test your site in a monkey approved environment to ensure that everything is working smoothly before launching. We will provide benchmark testing so you and your team can see what improvements you can expect. You’re the boss. Seriously. You know your website and your organization best. Not only are we working for you, we are working with you. That means we launch your upgraded website only when you are happy with the results from the benchmarks. Ready, Set, Launch! Regularly, an upgrade of this magnitude would cost $5000.00 and up. We’re offering it to you for only $3000.00! That’s a savings of more than $2000.00! What's that look like in numbers?